So you own a beach house, are about to purchase a beach house, or have Ocean Isle Real Estate you want to sell? That’s great news! You’re one of the lucky ones. But you say the floors of your property are in awful shape and you want to replace them? Not a problem! You’re probably wondering what type of flooring you should consider when living in a beach community. You want something practical, that’s for certain. The next consideration needs to be, is this your beach house or your primary residence? Does it really make a difference? A beach house is designed for fun. Walking in, straight from the beach and tracking water and sand across the floors is commonplace in a second home. If this is the case, more utilitarian options for the floors are a practical solution. 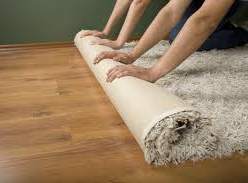 A berber carpet, or low cut loop is a good choice as the carpet piles are not likely to capture and retain sand and the little bit of water tracked in will not hurt the carpet because it will dry quickly. An olefin loop will be nearly waterproof and a great option as well. For hard surfaces, tile is always a good choice as it easily sweeps clean and sand will not scratch or degrade the finish. If you like the look of wood — and more and more people are turning to it these days based on all of the Ocean Isle Real Estate we see — an engineered hardwood that can live up to the changes in moisture is great, but an aluminum oxide finish is preferred. If this is your primary residence, of course, you can be a little more focused on style and design and a little less focused on functionality. If you plan on heading to the beach regularly, I would still keep an eye on the basics listed above. Keep in mind beach color palettes tend to be light — whitewashed woods, light nautical themed tiles, and blue and green tones tend to fit in quite well in the coastal area. Overall, when shopping for flooring for your Ocean Isle Real Estate, keep an eye on function as well as on your beautiful surroundings for design inspiration.